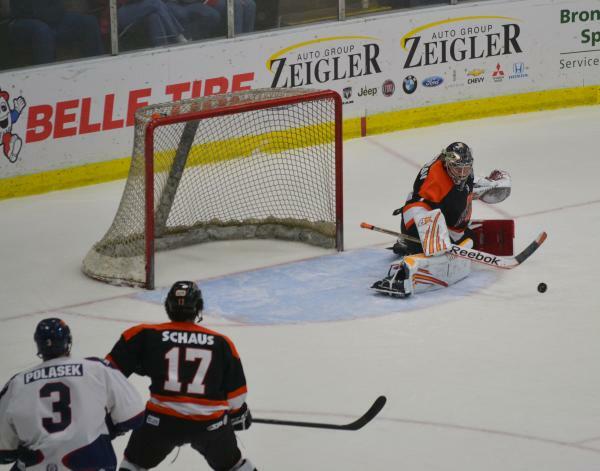 Komets won 6-5 behind Thomas Beauregard's hat trick, but they lost goaltender Charlie Cousineau with 6:50 left to a pulled groin injury when he made this pad save. Cousineau was unable to put any weight on his right leg after the game, and had to use crutches to get around the locker room. He finished with 31 saves on 35 shots before being injured and replaced by Charlie Effinger.